In the opinion of this writer, the Revolution that took place in France in the 18th Century completely and utterly failed in its primary objective, which was to bring about a society where there are no social classes and all people are treated with total equality. There. You just turned a simple eleven-word sentence into a sprawling forty-six worder. Click to Subscribe Now to the WriteAtHome Blog! Conscientious and observant teachers call this padding and penalize it, but what they often fail to realize is that the very nature of the assignment encourages this kind of blather. By basing the grade, even in part, on the number of words a paper contains, teachers communicate that excess verbiage is a good thing. WriteAtHome assignments come with suggested length in terms of pages. For example, we may suggest a report be two to three pages long. Originally, we didn’t include this information, but we were so bombarded by questions about required length that we caved. It was easier to give a guideline than tell the Abraham Lincoln story. The truth is, we think a paper’s length should be determined by its content and purpose, not arbitrarily prescribed. Some stories just take longer to tell than others. Some topics require more explanation. Some arguments demand more detail to be convincing. Since we are working with individual writers in a tutorial program (rather than a competitive, graded, classroom context), we are under no pressure to level the playing field arbitrarily. 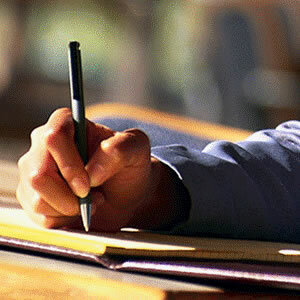 This allows us to encourage concise, economical writing rather than excessively verbose writing. So when a student asks, “How long does this have to be?” we can answer: Just long enough and no more. Your comments are welcome. Please respond below with your thoughts and questions. to know such a great website at hand! Thanks! Glad I can help, Alexis. I agree with you, Brian. Holistically, this is the way assignments should be administered. However, there are plenty of students out there who would find a way to take advantage of this system. If they didn’t get a good grade because their content wasn’t sufficient enough length-wise to get their point across in an intelligent way, they might be able to protest if the syllabus doesn’t say anything specific about length. This could be a serious problem as some professors may bend to students wills so as to avoid poor reviews, eliminating the good intention of this theory of yours. Of course, it could be avoided if the university/school set up some sort of policy protecting professors from being taken advantage of in the aforementioned way. What do you think? There were other non-standard and out of the box style instructions, but you get the point. The idea was to learn how to be brief, pithy, and effectively argumentative. Almost every writing book I’ve ever read has said something to the effect of, “Forget everything you learned in high school about writing”— especially in regards to word counts and verbosity. Fortunately, I didn’t have to relearn anything because I learned it right the first time around! As a college writing tutor, I am almost daily faced with word count questions and issues. When a professor dictates a minimum word count (as usual), the student and I search together for ways to include pertinent description and more concrete examples instead of artificially attempting to add wordiness which does nothing to clarify. I am also grateful for the helps I have learned from you and Write at Home regarding wordiness. That’s great, Merri. Too bad most student writers don’t have access to such wise writing advice. I have fewer concerns about maximum word counts. Having to cut words is a good exercise. It’s minimum word counts that teach bad habits with young people. I am currently a middle aged male in college training for a second career. I am in college comp which, as you know, is a ton of writing. My question is, I don’ t know the basics of writing, such as punctuation, structure of a sentence, etc, and my instructor is very vague on instruction, I’m lost on so many things, can you help me or point me to someone who can? Sure, Brett. My blog has a Free Resource page that includes a good number of useful articles addressing basic composition, punctuation, etc. But, generally speaking, Google can be your best friend here. If you are unsure of an issue or need help with grammar, do a search and you are likely to find plenty of good resources. It’s a bit dated in terms of design, but it’s loaded with basic information and was created by a community college professor. If you run into particular questions that you can’t find answers for, feel free to post a question to my Facebook page or send me a private message there: facebook.com/WriteAtHome. I noticed that http://www.coursera.com is offering a free writing course for those who need help with writing basics. You might check in to it. That’s great to hear, Emily. I really liked this paper it made me think of what I should put in my 500 word essay and I was hitting a road block at 465. Thanks alot.